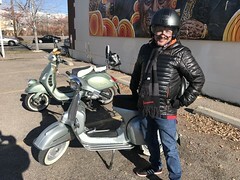 We recently read on modernvespa.com about the sad story of a Vespa rider here in the American West who wanted to join a local scooter club but surprisingly they denied her membership because she didn’t ride the brand they rode. In response, we here at TBSC made her an honorary member and sent her our membership kit! Let us be clear here. 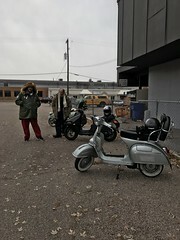 We at TBSC believe that Scooter Clubs are NOT about exclusivity. The best clubs invite anyone with a similar passion to share in the enthusiasm a club represents. 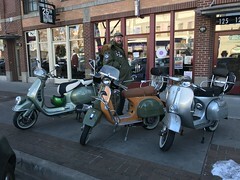 We regularly welcome scooters of all shapes and sizes as well as motorcycle riders to join us on our rides. We want to include anyone who shares our joy of riding. Passion for your ride is at the core of what we represent. 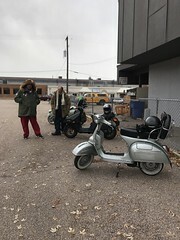 People who join our scooter club look at their vehicle more than just a mode of transportation, they love to ride and be a part of something more. We welcome our newest “remote” member and hopefully she finds some friends in her area who will share her excitement and enthusiasm for scooters! 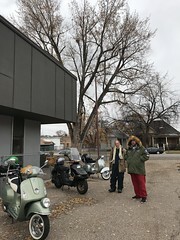 Just read about the woman who was rejected from a scooter club on Modern Vespa, then followed the link over to here…you folks RAWK for making her an honorary member! Wish there was a scooter club here in Palm Springs and the surrounding valley…perhaps I should follow y’all’s lead and start one myself! You should! It’s easy and fun. 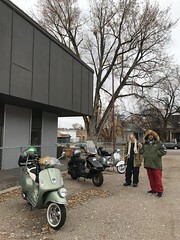 We created the club out of a love of scootering and now have a consistent group. Palm Springs has a great riding weather for much of the year so I imagine you will find some fans! a Classy thing to do.